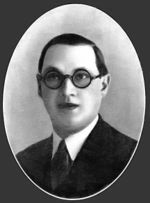 MAS (Motocicli Alberico Seiling) was founded by Alberico Seilig, a successful motorcyle designer. Early machines had 148cc, 173cc and 244cc ohv and sv engines with pedalling gears and large outside flywheels. 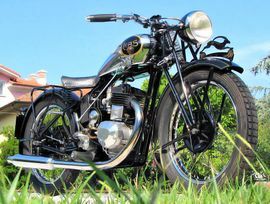 Production in the 1930's concentrated on budget priced 248cc, 348cc and 568cc side valves along with a luxury touring model with a 498cc ohv engine. Most late '30's models offered rear suspension and all models had inclined cylinders. During WWII, MAS supplied the Italian forces with 498cc ohv singles and a 173cc two stroke. 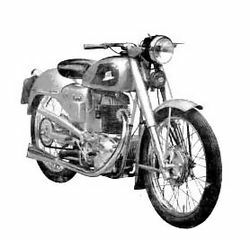 An innovative 122cc single, the Stella Alpina, was introduced in the late '40s. It had a top end cast in the form of two concentric cylinders with an inner cylinder joined to an outer cylinder by a series of vertical fins. The theory behind it was that such a configuration would keep the engine cool at low speeds. It was not a commercial success. More conventional models in the '50s had 173cc ohv and ohc engines, and an interesting 500cc ohc twin intended for racing never left the prototype stage. 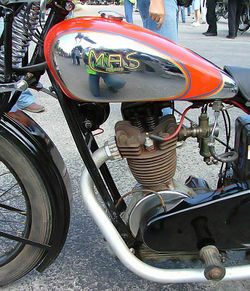 Before the company folded, MAS was reduced to making utilitarian 124cc two strokes and a Sachs engined 49cc mini-scooter. This venerable Milanese company closed its doors in 1956.